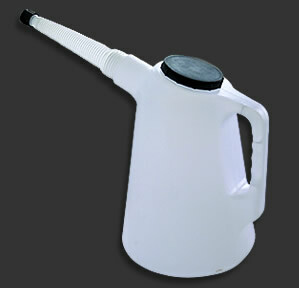 1 Liter (1 Quart) flexible spout measure. Made with durable polyethylene bodies, and precision-made headcaps, spouts, and protective caps to keep out debris. SAE Products® flexible spout measures are the industry's finest! Features heavy duty translucent polypropylene construction, flexible spout for easy, drip free application, protective spout cap and lid, and raised quart and liter measurements on outside. Made in The USA.